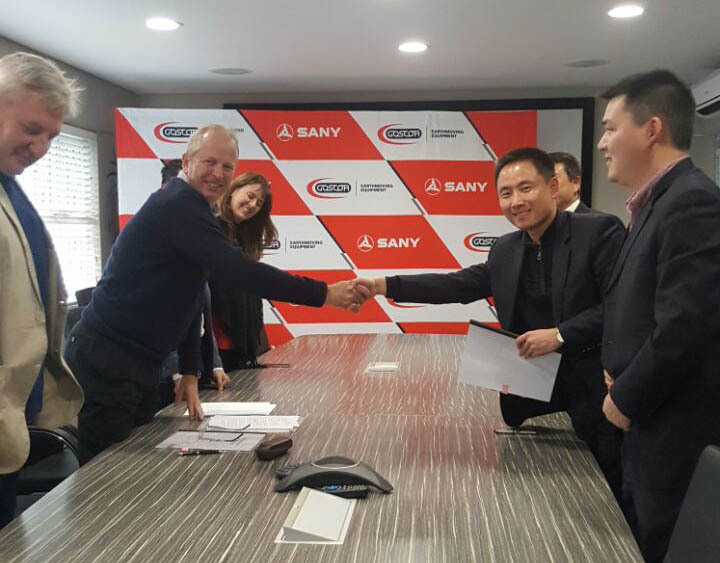 State-of-the-art industrial equipment specialist, the Goscor Group, has signed a key distribution deal to become the official dealer of Chinese multi-national Sany’s yellow plant equipment in Southern Africa. In accordance with the agreement signed on 17th May 2016, Sany will be incorporated under newly formed Goscor Earthmoving Equipment and will operate as a separate entity within the Goscor Group. Wilson also affirms that alongside the impressive competitiveness of the Sany machines in terms of price and running costs, the large-sized equipment present a perfect balance to the Group’s machine offering. Sany brings to this industrial table large high quality, robust value-for-money machines and technical strength. Zhu adds that easy finance of their capital equipment is offered through Sany Capital Southern Africa (Pty) Ltd.
“The fact that this deal follows not long after the Executive Management buyout of Goscor shares from JSE listed Imperial Holdings bears testament to the ongoing growth and success of the industrial equipment powerhouse that the Goscor Group is today,” concludes Wilson. Operating from offices in Alrode, Alberton, south of Johannesburg, Sany will tie into Goscor’s expansive regional footprint and have access to its infrastructure and strategic network, giving customers immediate access to the Sany yellow equipment range. The Goscor Group of Companies have been supplying the South African market with state-of-the-art industrial equipment and solutions since 1984. Established by George Owen Siddle, the Group now consists of 10 impressive companies, each supplying the market with unique products and services from top brand names around the world. Sany Southern Arica was established in 2006, with the head office located in Johannesburg, South Africa. SANY rose and prospered after 10 years of development. The current annual sales revenue is nearly 50 million USD, and the total sales revenue has accumulated over 200 million USD since 2006. Now there are about 40 Chinese staff together with more than 1000 units’ SANY equipment working in South Africa.